Here's another recipe that I first ate at Dagmar's. It's a really nice chicken dish - perfect as part of a small spread. Last time we ate it, we served it with dumplings, a noodle salad, and a wonderful dipping sauce. Mix all the ingredients for the marinade in a blender or a food processor. Put the chicken in a plastic bag and cover with marinade. Let it soak for at least two hours, in the fridge. 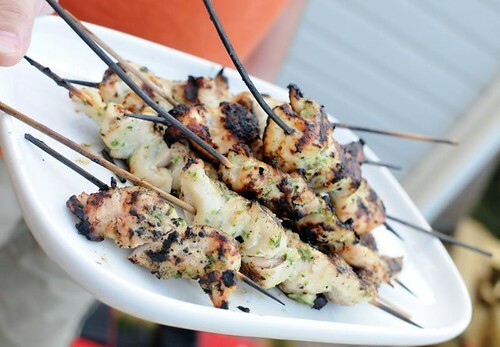 Skewer the chicken (on pre-soaked wooden skewers) and grill on high heat for a few minutes on each side. Check to make sure they're cooked through. You can cook these in the oven as well, if it's not exactly barbecue weather. Those look so good, and healthy! Great recipe!